A Federal Trade Commission report on the pet medications industry noted fast growth and a changing landscape of suppliers – with veterinarians seeing increased competition from non-traditional sellers, and consumers finding more ways to buy medications for their pets. 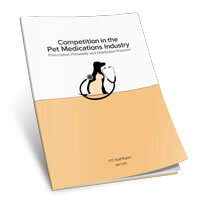 The report made recommendations for ways to make the pet medications market even more competitive. Based on information gathered, in part, from an October 2012 workshop, the report noted that American’s overall spending on their pets has doubled over the last 12 years, and that a significant portion of that spending is devoted to prescription and over-the-counter medications. Of the nearly $56 billion that consumers spent on their pets in 2013, $7.6 billion was spent on prescription and over-the-counter medications for dogs and cats. Significant improvements in traditional pet treatments for flea, tick, and heartworm, as well as the introduction of new treatments for chronic conditions in pets, have contributed to the increase in spending. As consumer demand for pet medications has increased, so have the channels for distribution, according to the report. While most consumers still get over-the-counter and prescription medications for pets from their veterinarians, the number of retail pharmacies and other retail outlets competing with veterinarians has increased significantly over the last decade. Another option for consumers has been online pharmacies, which have sold pet medications, often at discounted prices, since the late 1990s. More recently, according to the report, big-box retail stores, supermarkets, and chain retail pharmacies have begun selling some of the largest volume of pet medications, and many of these retailers advertise even greater discounts than online pharmacies. consumers had more low-priced generic animal drug options to choose from. A variety of stakeholders, including pet medication manufacturers and distributors, veterinarians, non-veterinary retailers, pharmacists, and consumer advocates participated in the FTC workshop. In addition to the public workshop, the FTC received and reviewed more than 700 written public comments. The Commission vote approving issuance of the report was 5-0. The FTC’s Office of Policy Planning works with the Commission and its staff to develop long-range competition and consumer policy initiatives, consistent with the FTC’s unique mission to conduct research and engage in advocacy on issues that affect competition, consumers, and the U.S. economy. The Office of Policy Planning submits advocacy filings; conducts research and studies; organizes public workshops; issues reports; and advises staff on cases raising new or complex policy and legal issues. To reach the Office of Policy Planning, send an e-mail to opp@ftc.gov. Like the FTC on Facebook, follow us on Twitter, read our blogs, and subscribe to press releases for the latest FTC news and resources.